Who is Israel's Worst Enemy? But the F-35 program is not at serious risk, despite all the hysterical hype in the trade press — not by a long shot. The F-35′s political safety net has been front- loaded and politically engineered (the general practices of the power games are explained here) with exquisite malice of forethought. Domestically, the F-35 employs 130,000 people and 1300 domestic suppliers in 47 states and Puerto Rico. The only states missing the gravy train are Hawaii, Wyoming, and North Dakota. Internationally, there are already cooperative development/production plans involving nine countries, and more are in the offing. Given the intensity of the geographic carpet-bombing of contracts around the globe, can there be any question why the Secretary of the Air Force said in September, “”Simply put, there is no alternative to the F-35 program. It must succeed.” If you think that is an accident, dear reader, I have a Brooklyn Bridge to sell you. I will be writing more about many of these problems in the future, but today I want to concentrate on the gold-plating process at the front the end — by introducing a remarkable discussion of requirements creep. At issue is the short take off and vertical landing (STOVL) F-35B for the Marine Corps to replace its AV-8B Harrier jump jets and its F-18C/D fighter/bombers. My friend Bob Cox, a senior reporter for the Fort Worth Star-Telegram posted an amazing entry by a serving Marine on hisblog. Cox has given me permission to reproduce it below. Occasionally someone in the active duty military has the courage to go off the script and say what they really think about their service’s dogma and pet projects. Here’s a piece by a Marine aviator questioning the value and purpose of the Marine Corps love and commitment to the STOVL fighter-attack airplane, the Harrier and now the costly and complex F-35B. Other analysts and experts have said it before, probably some Marines too, but in his blog “Boats Against the Current,” Peter J. Munson, an active duty officer and KC-130 commander, lays out much of the case against the F-35B. Marine generals love to argue it gives them the capability to go fight close to the front lines, without air bases, but never bother to add how many truckloads of fuel and supplies and men and defense weaponry will have to be hauled over land to that forward base, and at what cost and vulnerability to enemy attack. The Harrier has surely been a large part of Marine aviation since 9/11, but its STOVL characteristics were rarely, if ever, critical to the conduct of operations. If anything, the capability was a liability when it came to the requirement for long on-station times, multiple ordnance options, and tedious scanning of compounds and cities with targeting pods in support of troops on the ground. While Harriers have conducted some forward rearming and refueling at shorter strips, these were more driven by the Harrier’s limitations and the desire to validate its expeditionary capability than a value added to the fight. That is, while a Harrier was rearming and refueling, a Hornet would be overhead, sensor still on target, refueling from a KC-130, more weapons still on the wing. So, when the program hits a rough spot again, which I think it will, and when the budget adjusters come knocking, the Marine Corps needs to be honest about how much STOVL capability it really needs to maintain its close air support capability aboard amphibious shipping, how soon unmanned aerial systems can fill that gap, and what the best option is for the rest of our close air support needs. One can’t help but suspect that when former Defense Secretary Bob Gates put the F-35B on probation last January that he had some of these same arguments in mind, but didn’t want to fight a war with the Marines in his final months in office. Secretary Panetta last week swooped in and freed the “B,” winning friends in USMC HQ and Lockheed Martin, among othe places. The extraordinary complexity and demands of the F-35B have undoubtedly hampered the whole F-35 problem, creating technical problems and sucking up limited (in Pentagon terms) development dollars and engineering resources. The need to redesign the whole aircraft (all three models) to take out weight was largely an effort to salvage any combat payload for the B-model. Now, with the airframes of early planes showing cracks and wear and tear early in their lives one has to wonder how much of those and future problems will be due to weight reduction for the F-35B. Attached herewith is an essay written by William R. Polk outlining a strategy for diffusing the Iranian crisis. I am posting it with his permission. He is a historian and foreign policy expert who specializes in the Middle East and Central Asia. The essay is written from the perspective of foreign policy. Polk lays out parameters to be considered and introduces a possible strategy for diffusing the U.S.-Iran crisis. Bear in mind, Polk does not address how the US government would would resolve what he acknowledges are ‘tricky’ -- and I would add potentially explosive -- domestic political issues attending to his solution; like for starters the oil and Israeli lobbies the President must neutralize with when designing a solution. An engineer might think of Polk’s proposal as a preliminary design concept that needs to be fleshed out by the limitations of what is possible. I believe it is a good starting point for evolving a cogent national debate at a time when passions, interests, and factions are driving perceptions. The only real solution to nuclear weapons in the Middle East is a nuclear free zone. I have been hammering away on that theme for years. In addition to many papers on my website, I wrote about it extensively in my little 2009 book Understanding Iran. However, as I pointed out in that book (p. 209-211) as hard as it would be to achieve regionally, it would be even less likely (or attractive to Iran) so long as America takes an aggressive stance toward Iran. Since "Once a country acquires a nuclear weapon and the capacity to deliver it, it is immune to attack. Thus, I believe, it would be ahistorical and illogical for Iran not to be acquiring at least the capacity to manufacture a nuclear weapon...What restraints are there, or could there be, on such a policy? It is almost certain that threat is not among them. The more Iran feels threatened the more incentive it has to push its nuclear program toward the acquisition of a weapon. Nor have sanctions worked. Particularly against a less organized and therefore less fragile economy, sanctions have little leverage. They were tried by the British against Iran in the 1950s without result." So I laid out (p 211) a three-step policy that i thought (and think) has the best chance as things now stand. What might change? ironically, it may be that only if Iran actually acquires a weapon will the Israelis agree to a nuclear free zone. The danger, obviously, is that the Israelis will attack during the acquisition period. They keep on saying that they will and I believe them. I have been crying "wolf" for years and while I, like the little boy in the fable, was wrong, the wolf really was there and finally ate the boy. What would invite an attack -- if i were an Israeli hard liner, I would think -- is that Israel doesn't have to win or even to have a chance of winning or even slowing down the Iranian acquisition process. All it has to do is to start the conflict. Then, the US will almost inevitably be drawn in, even if the Republicans don't win the White House. And once drawn in, where could the US stop? The very momentum of conflict and the inevitable burst of short-sighted American gung-ho patriotism would carry it onto the ground. If the Iranians surprise us all and manage to sink a carrier or even a tug, could Obama stop? if they scare the hell out of the oil shippers and gasoline prices leap at the pumps throughout America, could Obama stop? So, the Israelis have their hand on the throttle and no one I can see has a hand firmly on the brake. There is another, more obscure, factor that i feel strongly: people get jaded at the jumping off place. I remember with real fear and personal shame that when i was a member of the Crisis Management Committee during the Cuban Missile Crisis, there came a moment -- fortunately it quickly passed but it was seductive at the time -- when I thought, "what the hell. We might as well get it over with." I was exhausted. And I assume JFK, Bob McNamara and others were more tired than I. I don't profess to share many human emotions with Bibi, but I could conceive of his jumping across the line when under such (even if largely self-generated) stress. 1.) Go back over what you and I know and put on a sort of "fire-side chat" more elaborate than FDR used to do to explain what a confrontation would do, with or without nuclear weapons; in my terms, the fundamental task of a president is to be the nation's teacher. He could and should do that job. He has not. In my moves around the country, I don't get the impression that people really appreciate what a nuclear or even a large-scale conventional exchange -- or even a one-sided attack -- would do. Hiroshima was in the Middle Ages and iraq and Afghanistan don't much frighten anyone. The public must be educated if our government has a chance to lead it. 2.) Either having the US take the lead or following close behind the NATO powers or, better yet, the 2nd tier powers (Turkey, Brazil, China et al), and call for a firm, clear, and definitive renunciation of the 2005 US National Security Paper. It has been somewhat put aside but not really renounced. It must be to make any progress. The US must take preemptive or first strikes off, in that dangerous phrase, "the table." Unless or until that is done, the Iranian government, in my opinion, would be foolish to slow down, much less give up, moves to acquire a weapon. Such a statement must be given reality by the pull back of the massive armaments we have on the Iranian borders. 3.) There must be a universal, or as nearly universal as possible, statement recognizing Iran's sovereign independence and outlawing threats to it. This may not count for much. The international record is not good on such statements, but they are necessary if not sufficient. We should experiment with ways to give them verisimilitude. Perhaps one would be under the "Uniting for Peace" resolution of the UNGA with real penalties for violation even in policy pronouncements. So, as I say, it seems to me that option ‘4-c’ may ironically be the most productive policy for long-term stability and peace. Fostering or allowing it to happen would certainly be tricky. Tricky domestically as well as internationally. Here is where we need a teacher-president. We are far less sophisticated than we need to be and the Iranians have little reason to trust us and none to trust the israelis. But I don't see any thing better. The path we are now on leads, in the direction of war and my experience, particularly during the 1962 missile crisis convinces me that it is very easy, perhaps even inevitable, to trip on that path. Almost 30 years ago, in 1983, The Heritage Foundation stepped forward as a thoughtful, independent thinking participant in the then-raging debate over Ronald Reagan’s defense budget increases. In one of its major policy publications, Heritage published an insightful analysis with an unambiguous conclusion: “The increased spending secured by President Reagan should afford significant improvements in force size. It does not.” (See Agenda ’83: A Mandate for Leadership Report, Richard N. Holwill, ed., The Heritage Foundation, 1983; see chapter 4, p. 69 of “Defense” by George W.S. Kuhn.) The analysis was crammed with data and straightforward logic as it made the case for real reform in America’s overpriced, underperforming defense budget. Each of us knew and worked closely with John Boyd. Invoking Boyd’s legacy to endorse Carafano’s ideas about the F-22 and the F-35—ideas that would have been anathema to Boyd—profoundly offends us. Demonstrating ignorance about both John Boyd’s thinking and about fighter aircraft fundamentals, the Carafano article’s pervasive disregard for facts provides an excellent example of the ethical bankruptcy that lies at the core of our defense problems and our defense budget debate today. With this editorial by their Director for Foreign Policy Studies, Heritage signals a descent from serious analysis of the nation’s defense needs to contemptible gimmicks for pushing the big-spending agenda of the Foundation’s defense industry funders—specifically, in this case, pushing the agenda of Lockheed-Martin, manufacturer of the F-22 and F-35 and major contributor to Heritage . The starting point of Carafano’s advocacy of more F-22 and F-35 spending, his spin on Boyd’s profound analysis of why American F-86s outfought Russian MiG-15s in Korea, is both shallow and wrong. He claims Boyd found that the MiG-15’s major advantages in altitude, speed and turn were overcome by the F-86’s “bubble” canopy which enabled its pilots to see the MiGs first. In fact, Boyd’s energy maneuverability analysis of the two fighters showed that the MiG had only small, relatively insignificant turning and accelerating advantages and that there were no speed differences of any tactical consequence. Boyd did indeed believe the superior rear visibility through the F-86’s bubble canopy was an advantage (and insisted on an even better canopy for the F-16), not to see the enemy first but to avoid being “bounced” by surprise from the tail quadrant and to avoid losing sight of the opponent during dogfight maneuvers. But Boyd’s most important insight into the technical advantages of the F-86 escapes Carafano entirely. Boyd saw that the F-86′s far quicker control response, due to its then-new hydraulic controls, allowed American pilots to transition far faster from one maneuver to the next. And those much faster transitions allowed the American pilots to confront the enemy with increasingly confusing and incomprehensible tactical moves and countermoves—the key to gaining firing position and dogfight victory. And that crucial insight led to directly to Boyd’s seminal OODA (observe-orient-decide-act) loop concept, the foundation of the innovative and much more encompassing theories of human conflict that made Boyd the most important military thinker of the last century. Not only did Carafano miss the boat on the technical differences between the F-86 and MiG-15, he ignored the even more important Boydian idea that, to win wars, people come first, ideas (i.e., tactics and strategy) are second, and hardware is a distant third. It was perfectly obvious to Boyd why two hundred F-86s achieved air superiority over 1000 MiGs in Korea and shot down 5 to 10 enemies for every American loss. Our pilots were simply far more skilled than the Chinese and Russians by virtue of better selection, more rigorous and realistic training using better tactics and better exploitation of the skills of experienced pilots, and far more flying hours (the much more reliable F-86 flew 40 hours per month to the MiG’s 10 or 12 hours). Had we changed aircraft with the enemy, our lop-sided victory tally in Korea would have been the same—an insight repeated almost verbatim decades later by the Israeli Air Force commanders after the 1973 and 1982 wars, then again by the U.S commander of the Persian Gulf War in 1991. Despite John Boyd’s seminal role in designing the F-15 and F-16, he was always the first to point out that technical differences in friendly versus enemy aircraft are minor compared to differences in people skills—and that applied with equal force to ground and naval weapons. Which brings us to Carafano’s relentless promotion of F-22 spending. His opening focus on the F-86’s bubble canopy is ironic. The F-22 lacks such a bubble canopy and therefore has far less rearward visibility than the F-86—and far less than Boyd’s F-16. The F-22 is an even worse step backwards—a catastrophic one—in the pilot skill dimension. The plane is not just incredibly expensive to buy (now at $411 million per copy in terms of total program cost, it is still growing), it is also far too unreliable, far too unmaintainable and far too expensive in operating cost (at $61,000 per hour and also growing) to provide even minimally adequate training. For four months in 2011, the entire fleet was grounded due to engine cooling air and oxygen system related failures that the Air Force still cannot explain; when it was flying, pilots only flew an abysmally inadequate eight to nine hours per month. This is only one-third to one-quarter of the flying hours that elite air forces use to train truly competent air-to-air fighter pilots. Thanks to the F-22’s ludicrous eight to nine hours per month, our once-premier fighter force is decaying rapidly. To this Dr. Carafano is oblivious. Moreover, even if technical performance were the dominant factor in air combat, the F-22 is no premier fighter. Its aerodynamic performance—maneuverability, acceleration and range—is a gigantic disappointment. The F-22 purports to compensate with technologies—radar, radar warning and radar missiles—that historically have failed time and time again; technologies that make the airplane more vulnerable to enemy countermeasures, not less. Finally, two of its hyper-touted “Fifth Generation” characteristics—“stealth” and “supercruise”—are, in truth, astonishingly limited. F-22 stealth is a delusion: every VHF (i.e. long wavelength) radar in the world can detect the F-22 at 150 to 200 miles, and the Russians, and others, have built and sold thousands of such radars. The F-22’s “supercruise”, that is, its ability to cruise supersonically, is unusably short in duration (due to inadequate onboard fuel capacity)—so short that current Air Force training missions to exercise supercruising combat actually schedule one tanker refueling just before going supersonic and one more refueling before going home subsonically. Imagine having to schedule two tanker hook-ups for every F-22 sortie in the chaos of a serious shooting war! Secretary of Defense Robert Gates’ decision to terminate F-22 production should be appreciated as his single most positive contribution to American air power—and certainly one of the very few issues he would have seen eye to eye with John Boyd. We say this, not just because of our various backgrounds in combat aircraft design, defense acquisition, weapons testing, defense budget analysis, and defense budget politics, but also because we know what John Boyd, Dr. Carafano’s erstwhile icon, had to say about the F-22. He despised both the F-22’s design and its acquisition program; it violated every idea he fought for in fighter design and every principle he formulated to help American forces prevail on the battlefield. In the late 1980s and early 1990s, before he died, Boyd often expressed his utter contempt for the F-22 to each one of us, always in terms too colorful to print. It gets worse regarding the F-35. When Boyd died 15 years ago, the inevitable failure of the F-35 as a viable combat aircraft was already clear, though not as crushingly obvious as it is to today. In 2012, with the airplane just 20 per cent through its entirely inadequate flight test plan (over 80 per cent of the airplane’s performance characteristics will remain untested in any planned flight test), we already know we are facing across-the-board failures to meet original specifications. 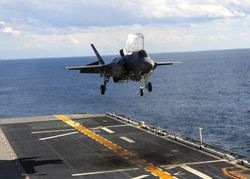 Moreover, if the F-35 lived up to 100 percent of its depressingly modest design specifications, it would still be a complete failure in combat utility: a bomber of shorter range, lower payload and far higher vulnerability than the Vietnam War’s appallingly flammable, underperforming F-105 Lead Sled; an air-to-air fighter so unmaneuverable and sluggish in acceleration that any ancient MiG-21 will tear it to shreds; and a close support fighter that is a menace to our troops on any battlefield, unable to hit camouflaged tactical targets and incapable of distinguishing friendly soldiers from enemies. Individually and collectively, we often fretted with Boyd on the irresponsibility of equipping our people with such foolishly complex weapons designs, so bereft of practical combat effectiveness—and on the deep corruption of acquisition programs, such as the F-35’s, that deliberately plan to buy a thousand or more units long before user testing has fully probed combat utility. Dr. Carafano is free to pump out baloney that pleases his funders, but to invoke Boyd’s legacy to promote F-22 and F-35 spending goes beyond simple, and perhaps willful, misrepresentation. Here is a paradigm of the moral decay so visible among contemporary Washington defense “intellectuals.” These dabblers in defense pretend to serve seriously the real needs of our national defense and our people in uniform—when, in fact, they are serving the needs of foundations, universities, non-profits or politicians funded by defense mega-corporations seeking to expand their sources of government largesse. And, even in a shrinking economy, these dabblers easily find comfortable home bases and plenty of venues to publish or broadcast their paeans to big ticket programs and budgets. It was not always like this. In 1983, a very long time ago, The Heritage Foundation courageously undertook some in-depth, independent, pro-defense analyses to strengthen our defenses while reforming spending and easing the taxpayer’s burden. Today, Heritage’s defense efforts are homilies supporting smaller forces, less people in uniform, and more dollars to buy fewer weapons of increasing ineffectiveness. How sad. How pathetic. How destructive to the security of Americans. All these issues—declining combat effectiveness, increasing acquisition mismanagement, inadequate training and the lack of ethics in defense advocacy—merit serious discussion. If Dr. Carafano would like to engage in a public debate on these questions, we would be happy to accommodate him. THOMAS CHRISTIE, PIERRE SPREY, CHUCK SPINNEY and WINSLOW WHEELER (Bios) are authors in the anthology “The Pentagon Labyrinth: 10 Short Essays to Help You Through It.” The book is available at no cost, and its co-authors have waived copyright protection, so there are no limits on reproduction or distribution. Note: I added some hotlinks to assist readers in sourcing information underpinning Mike’s point and introduced a parethetical statement in [brackets] to clarify his reference to me. At the end of the cold war many writers predicted the decline of the traditional nation state. Some looked at the demise of the Soviet Union and foresaw the territorial state breaking up into statelets of different ethnic, religious, or economic compositions. This happened in the Balkans, former Czechoslovakia, and Sudan. Others, like Chuck Spinney, predicted a weakening of the state due to the rise of Fourth Generation Warfare, and the inability of national armies to adapt to it. [CS Note: The first paper addressing this problem was Col G.I. Wilson and William Lind, et al, “The Changing Face of War: Into the Fourth Generation” Marine Corps Gazette, October 1989] The quagmires of Iraq and Afghanistan lend credence to that theory. There have been hundreds of books about globalization and how it would break down borders. But I am unaware of a well-developed theory from that time about how the super-rich and the corporations they run would secede from the nation state. I do not mean secession in terms of physical withdrawal from the territory of the state, although that happens occasionally. It means a withdrawal into enclaves, a sort of internal immigration, whereby the rich disconnect themselves from the civic life of the nation and from any concern about its well-being except as a place to extract loot. Our plutocracy now lives like the British in colonial India: in the place and ruling it, but not of it. If one can afford private security, public safety is of no concern; if one owns a Gulfstream jet, crumbling bridges cause less apprehension – and viable public transportation doesn’t even show up on the radar screen. With private doctors on call, who cares about Medicare? To some degree the rich have always secluded themselves from the gaze of the common herd; for example, their habit for centuries has been to send their offspring to private schools. But now this habit is exacerbated by the plutocracy’s palpable animosity towards public education and public educators, as Michael Bloomberg has demonstrated. To the extent public education “reform” is popular among billionaires and their tax-exempt foundations, one suspects it is as a lever to divert the more than one-half trillion dollars in federal, state, and local education dollars into private hands, meaning themselves and their friends. A century ago, at least we got some attractive public libraries out of Andrew Carnegie. Noblesse oblige like Carnegie’s is presently lacking among our seceding plutocracy. E.g., Erik Price, who was born into a fortune, is related to the even bigger Amway fortune, and made yet another fortune as CEO of the mercenary-for-hire firm Blackwater, moved to the United Arab Emirates in 2011. This stratagem follows the template of Halliburton’s privatized military logistics activities as well as George Bush’s proposed Social Security “reform:” funneling public dollars into corporate hands. Attached is one of Uri Avnery’s best argued opinion pieces, and that is saying a lot, because Avnery’s writings are always outstanding. Avnery, one of Israel’s most respected peace activists, is a hero of the 1948 war and a former member of the Knesset. Avnery’s subject is grand strategy -- or more precisely, Israel’s grand strategic incompetence, although he does not use the term. Grand strategy is an often misunderstood term and often is used carelessly in the mainstream media and the sententious renderings of Beltway thinktanks. Readers not familiar with the concept of grand strategy or do not appreciate why grand-strategic incompetence guarantees self-inflicted disaster will find a short introductory primer on the subject at this link. Israel’s part in the rise of Hizbollah is less direct, but no less effective. They, too, owe Israel a big Shukran.